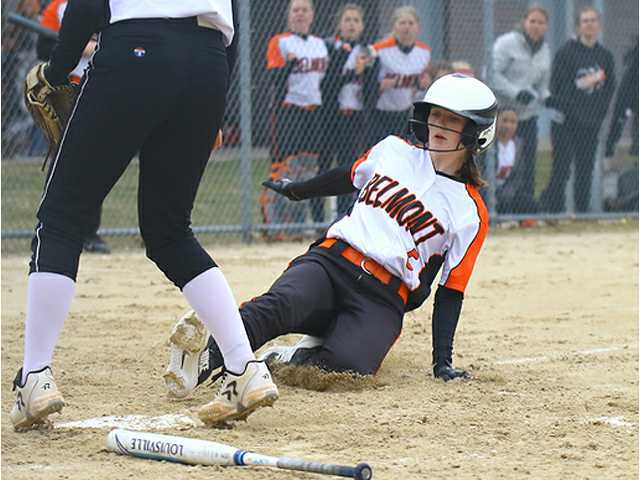 POSTED April 4, 2019 10:34 a.m.
Belmont senior Nikki Knebel scores on a Dodgeville error in the first inning of Monday's 4–2 win over Dodgeville. BELMONT — The 2019 Belmont softball team is no joke. Coach Jeff Hodgson’s Braves entered an unofficial claim to be this year’s champion of Southwest Wisconsin Conference by defeating preseason favorite Dodgeville Monday after noon on April Fools Day. It was Belmont’s fourth straight non-conference victory over SWC opponents. Belmont defeated River Valley in a preseason scrimmage Tuesday, March 19, then opened the season with a convincing 10–3 victory at Platteville last Tuesday. The Braves then blanked visiting Lancaster 8–0 on Thursday before holding on for a 4–2 victory over the visiting Dodgers Monday afternoon. Senior ace Sadie Willborn, the reigning Six Rivers West Co-Player of the Year, picked up her third victory of the season Monday against Dodgeville, allowing her first two earned runs of the season on seven hits in the complete game victory. She struck out six and walked three. The Dodgers (1–4) took an early 1–0 lead on an RBI single by pitcher Lindsey Murphy, but Belmont answered with three runs in the bottom of the first and never trailed again. Willborn drew a one-out walk and Nicole Knebel and Mackenzie Reuter hit back-to-back singles to load the bases. Two runs scored on a throwing error on a Mackenzie Shellnut dribbler up the first base line. Shellnut was tagged out on the play, but the throw to the plate to catch pinch runner Ashley Freeman was off the mark allowing her to score safely and Knebel came in to score as well as the ball bounced around foul territory. Callie Douglas added a clutch, two-out RBI single to put the Braves up 3-1. Dodgeville got a run back in the third when Grace Borne doubled and scored on a ground out. Bridgette Miesen doubled home Shellnut in the bottom of the sixth to give Belmont an insurance run. In Tuesday’s opener at Platteville, Willborn went 4-for-5 with a pair of doubles and drove in two runs to aid her own cause. Reuter drove in three runs with a three-hit day and Knebel and catcher Abby Althaus also went 3-for-4. Willborn struck out 10, walked two and allowed four hits in seven innings. Thursday afternoon she struck out 13 Arrows in a one-hit shutout. Willborn also had two RBI in the win. Althaus drove in a pair of runs for the Braves. Belmont (3–0) were scheduled to travel to Iowa–Grant Tuesday, and will now open Six Rivers West play Monday at home against Benton/Shullsburg. Leading hitters — D: Grace Borne 3x4; B: Callie Douglas 2x3. 2B — D: Borne; B: Bridgette Miesen. W — Sadie Willborn (3–0, 7IP, 7H, 2R, 2ER, 6K, 3BB). L — Lindsey Murphy (6IP, 7H, 4R, 2ER, 7K, 3BB). Leading hitters —B: Nicole Knebel 2x4. 2B — B: Abby Althaus, McKenzie Reuter, Sadie Willborn. W — Sadie Willborn (2–0, 7IP, 1H, 0R, 13K, 0BB). L — Brooklyn Connelly (6IP, 9H, 8R, 5ER, 7K, 1BB). Leading hitters — B: Abby Althaus 3x4, Sadie Willborn 4x5, Nicole Knebel 2x5, Mackenzie Reuter 3x4; P: Kaycie Wagner 2x3, Renee Vankirk 2x3. 2B — Althaus 2, Willborn 2, Reuter..
W — Sadie Willborn (1–0, 7IP, 4H, 3R, 0ER, 10K, 2BB). L — Kaycie Wagner (0–2, 6IP, 11H, 7R, 6ER, 5K, 4BB).